Starting with liftoff at in the Kiwanis Free Parking Lot downtown, the journey takes us first to an incredible perspective of Lynden’s iconic Dutch Windmill downtown set over the beautiful Nooksack River valley with Mount Baker visible in the background, then a journey down Front Street in Downtown Lynden with bright blue skies. 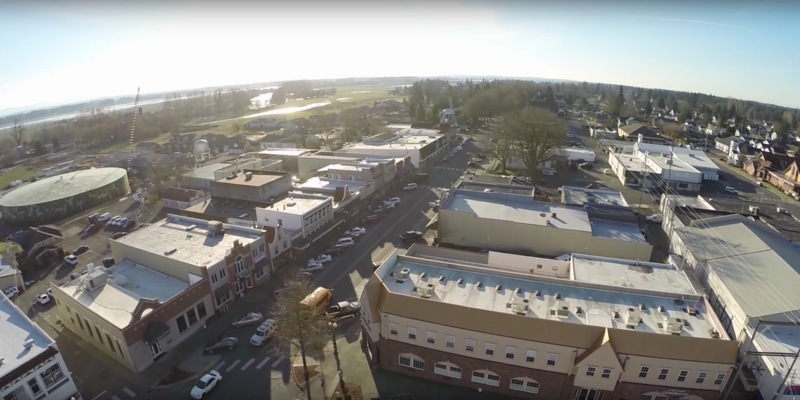 A shot taken from above the old ‘Delft Square’ (now Waples Mercantile Building and home of the soon-to-open Inn at Lynden and several other tenants) was filmed before renovations on the building started. 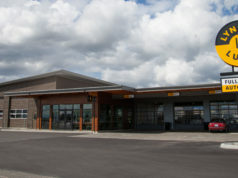 The large American flag flying over the historical Lynden Post Office is featured as well. The video continues, flying over Bender Fields and residential neighborhoods in Homestead area. Then, over a bit of the Jim Kaemingk Sr. Trail (also known as the ‘Lynden City Trail’). Next, we’re flown over Fishtrap Creek in Lynden City Park. In a cute scene, a couple of little girls wearing pink can be seen sitting on the edge of the creek, intrigued by the flying machine and attempting to point it out to their nearby parents who seem oblivious to it and likely had a hard time believing their story that a small plane just flew over the creek! ? The well-used ‘Million Smiles Playground’ at Lynden City Park is being enjoyed by several people as the tour flies by above. Then we fly over the Lynden High School track and football field, home of the Lynden Lions and countless Friday Night Lights football games, and track meets. At one point in the video, the drone carrying the camera is shown hovering in front of a blurry but still beautiful Mt. Baker. 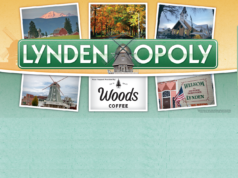 Lynden’s rich agricultural heritage is given a glimpse with some beautiful farmland with a traditional red barn and old silo. 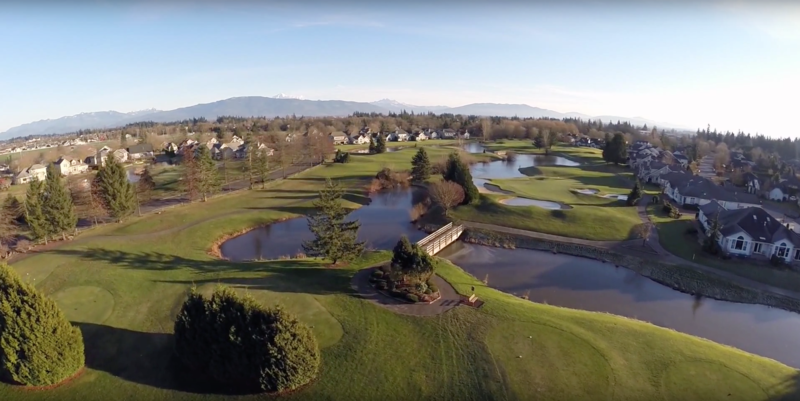 The ‘Welkom to Lynden’ mural painting downtown is featured, followed by a lovely view of the Homestead Golf Course and it’s many ponds. Toward the end, we are taken down the train tracks that run through town. Gassman says the music may sound familiar to those who have been to Disney’s California Adventure Park in Anaheim, as it is from the ride ‘Soarin’ Over California,’ which has long been a one of his favorites, with its unique view of iconic parts of California and wonderfully paired piece of music. 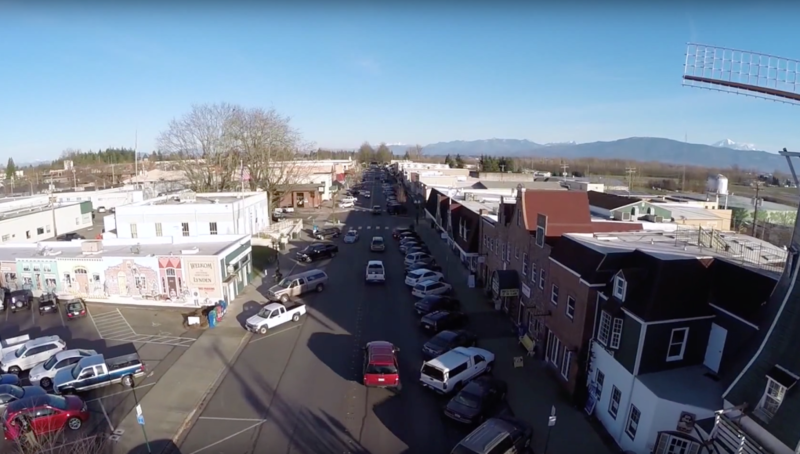 This video aims to do the same for Lynden. The full version of the video on YouTube starts with the journey from his home to downtown, including setup of the drone and battery installation. The first version of the video, called ‘Soarin’ Lynden’ was posted back in January 2015 and has a bit of different footage for those interested, and can be viewed at this link. 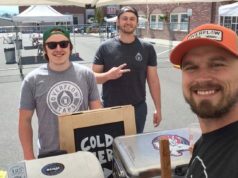 Next articleAn Update on Waples Mercantile Merchants: what’s opening next?